XTRA SAVINGS! Buy A Case and Save! Gunter's clover honey is Gunter's top seller. It is a light honey with a beautiful light golden color. A sweet and flowery taste with a long sweet finish. Gunter's is extra special due to the low moisture content. It pours thick and rich. Use it as a general use light honey cooking. An excellent honey for tea and coffee. Use it in baking or cooking. A good addition to a smoothie or use it in your basic vinaigrette salad dressing. 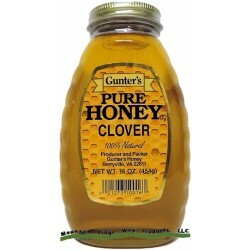 Gunter's Clover Honey - 5 lb. Gunter's Clover Honey - 12 lb. Gunter's Clover Honey Bear - 12 Oz. Net Wt. Gunter's Clover Honey Squeezable Tube Bottle - 12 Oz. Net Wt.